An adjustable base can be very useful to sleepers who want to customize comfort by changing positions. By adjusting the angle at which you rest, you can find the mattress position (or positions!) that best suits your lifestyle. In this review, we’ll be taking a look at the Lineal adjustable base from Saatva. This base is designed to help you find the right angle and position that’s going to be the most comfortable for your body, and all you have to do and lay back, relax and click your remote control. But adjusting position isn’t all this base can do, so let’s take a closer look at everything it has to offer! Click here to jump to the summary if you don’t have time to read the full review. WHAT IS THE LINEAL ADJUSTABLE BASE MADE OF? 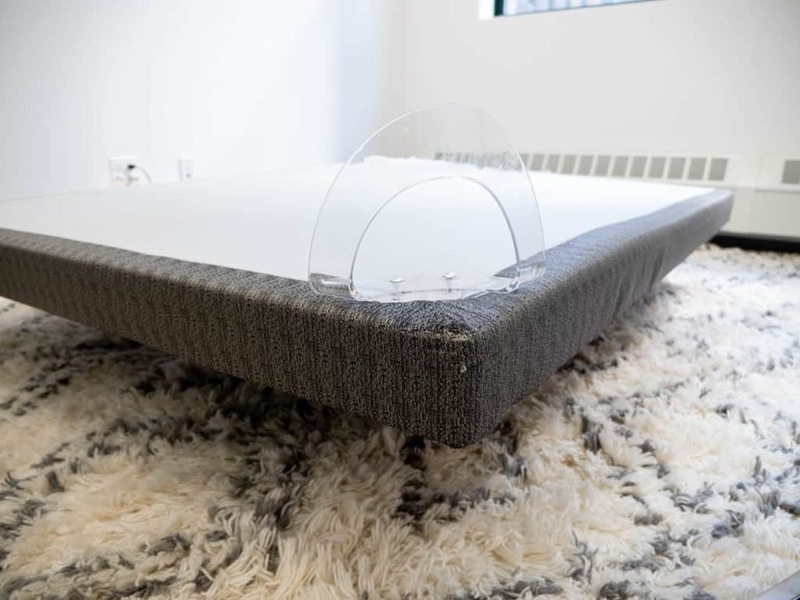 Before I get into the construction of Saatva’s Lineal adjustable base, I want to note that while this base was built to complement Saatva’s mattresses, you don’t need a Saatva mattress to use this base. Any adjustable base compatible mattress will do just fine. The mechanical part of this base (which are sort of the bones of the bed) are made from steel, and the foundation upon which the mattress rests is covered by one piece of polyester fabric. The steel is black and the polyester fabric is a grey color, so you don’t really have to worry about this base clashing with the decor you already have in your bedroom. Showing the bars on the underside of the Saatva Lineal. A thin layer of poly foam surrounds the edges of the base which is intended to add a bit of a comfort factor. 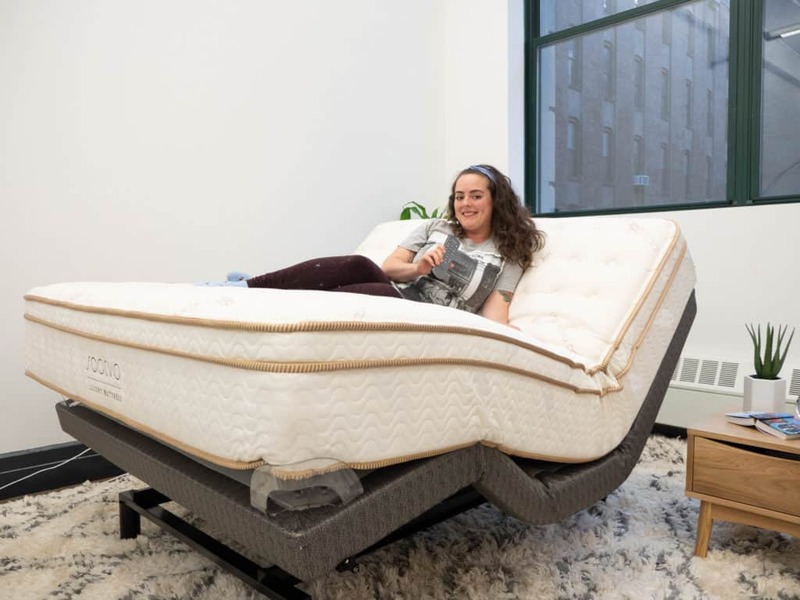 This way, as you jump in and out of bed, you don’t have to worry about banging into a steel bar — that added layer of foam is there to protect you. The base’s four legs are also made of steel and are adjustable as well. The legs can add up to four inches to the bed’s height (should you choose to adjust them), raising the Lineal from 14 inches to 18 inches off the floor. At the foot of the bed are two plastic corner retainers which serve to keep your mattress in place as the base shifts positions. This way, you can shift positions to your heart’s content and not have to worry about the mattress slipping and sliding around. HOW DO I ASSEMBLE THE LINEAL ADJUSTABLE BASE? You’ll be glad to know that assembling the Lineal is pretty easy! And by easy, I mean that after you order your adjustable base, it will be delivered to your home and completely set-up for you. The delivery people will also remove your old mattress, if you like, free of charge. How ‘bout that? You can, of course, assemble it yourself if you’re feeling handy — every Lineal comes with an instruction manual. The base itself is almost fully assembled when it comes, but the legs, headboard and mattress retainer clips are not yet attached. Since the base is pretty heavy, I’d recommend letting the delivery workers help you out! That being said, when the workers leave, they are no longer obligated to help you with set-up. But don’t worry, screwing in the plastic mattress retainers or adjusting the legs is pretty intuitive and, like I said, it comes with detailed instructions in the user manual. HOW DOES THE LINEAL ADJUSTABLE BASE WORK? Everything you do with your Lineal adjustable base is controlled using your remote control. 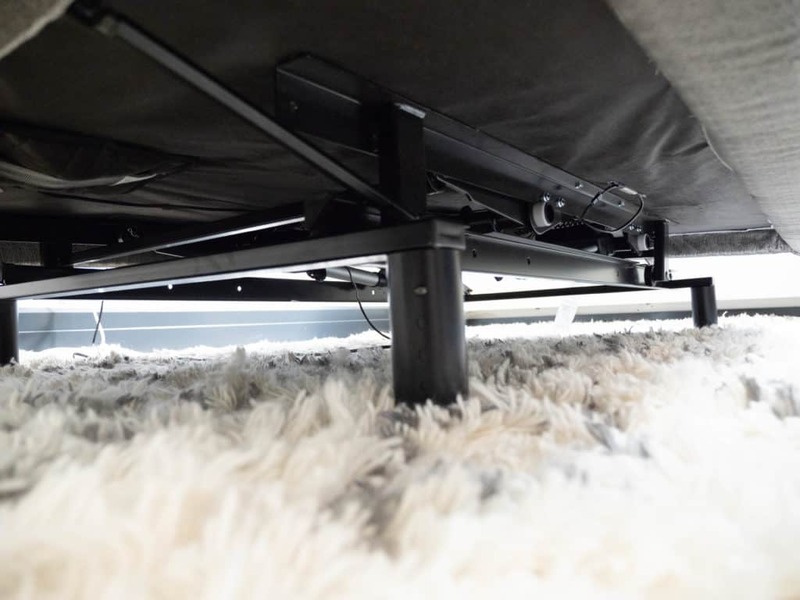 Like with most adjustable bases, you have the option to raise and lower the head and your foot of your bed until you find your perfect comfort zone. And adjusting position is easy to do as it is clearly indicated on your remote under “positions.” Just hit the “up” arrow to rise, and the “down” arrow to lower. Remember: you don’t have to choose one or the other, so get creative with position combinations! If no one is on top of the mattress as the Lineal transitions between positions, you’ll notice that there may be a bit of space between the mattress and the base. Don’t worry, that doesn’t mean anything is malfunctioning — it just means that there is not enough weight on top of the mattress itself! Thanks to the corner retainers, though, your mattress will not slide off the base regardless of your presence on the bed. While the Lineal’s angles and positions are easily achieved and quite comfortable, I should say that the speed at which the base transitions from one position to the next is rather slow. It is also very quiet (which kind of makes up for it), but in my experience testing this base, I found the slow speed to be a bit of an annoyance. There is also a feature that allows you to save up to three preset positions by using the “custom” button. For example, say you’re playing around with your adjustable base and you settle into a position that suits you perfectly, and you know you want to jump right into that position the next night, and the night after that. Just program it to be saved in your “custom” setting, and it’ll adjust to that position the next time you click it. This way, you can kind of personalize your base. It’s worth noting that, aside from the remote’s preset positions (like TV, Zero Gravity, and Flat), you must hold the button down — it’s not completely a one touch remote. WHAT ARE THE LINEAL’S FEATURES? Changing positions isn’t the only feature this base has to offer. There’s a button that turns your remote into a little flashlight, and a button that illuminates the underside of the base. Again, they are clearly indicated on the remote with little torch icons. 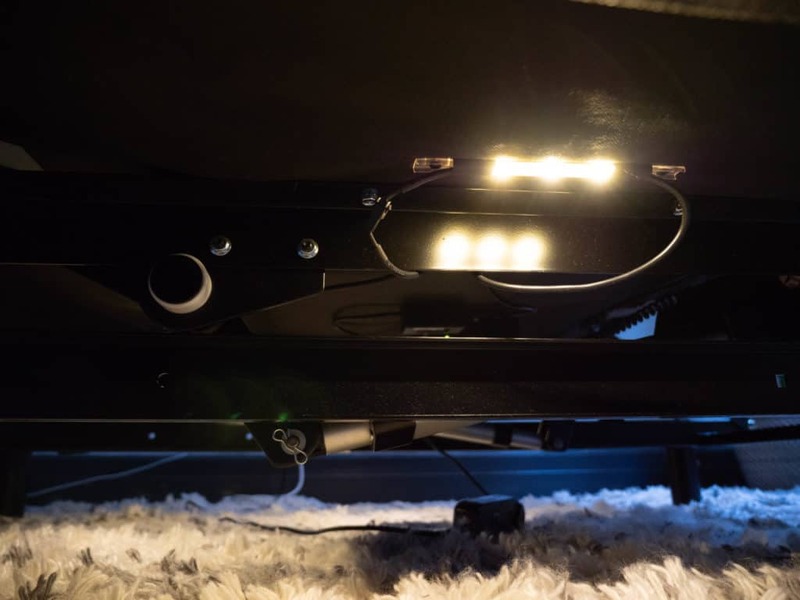 The underbed light feature is particularly intriguing to me, because it serves both a practical and aesthetic purpose. If you’re making a midnight trip to the bathroom and need a light to guide you out of your room, or if you drop something under your bed and need to find it without turning the bright overhead light on, the underbed light is a useful tool. In addition to functionality, it adds a nice, warm glow that, in my opinion, enhances the ambiance of the room a bit. 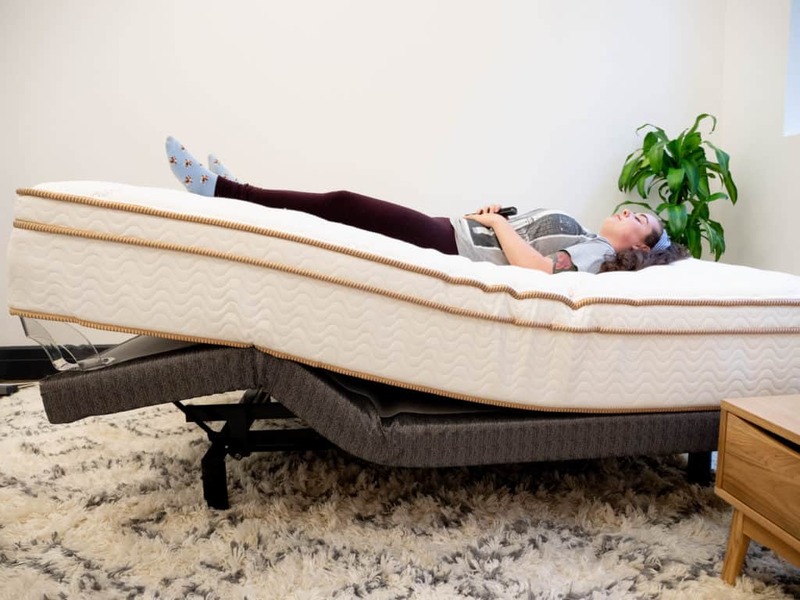 Then there’s the “zero gravity” feature which shifts the base into a preset position designed to make the sleeper feel “weightless.” This features angles the head and foot of the base to be positioned in such a way as to optimize the user’s weight distribution, enhancing blood flow and offering good pressure relief for your back. For folks who like to sit up in bed and watch movies, there is a preset position labeled “TV” which positions your body at an angle considered to be best for watching TV. As you might imagine, it sort of props your head up and raises your legs a bit almost as though you’re relaxing in a huge reclining chair. Any time you want the base to return to its original state, just hit the button that reads “flat” and it will slowly and quietly return to level, or flat, position. The bed’s also features a wall-hugging design which is pretty useful, especially for folks trying to save on space. Basically, if you want to put your bed up against the wall, you can feel free to do that without having to worry about damaging or scratching the walls as it changes from position to position. It’s designed to just glide near to the wall no matter what position you set it to. Oh, and did I mention that this base gives you a massage? 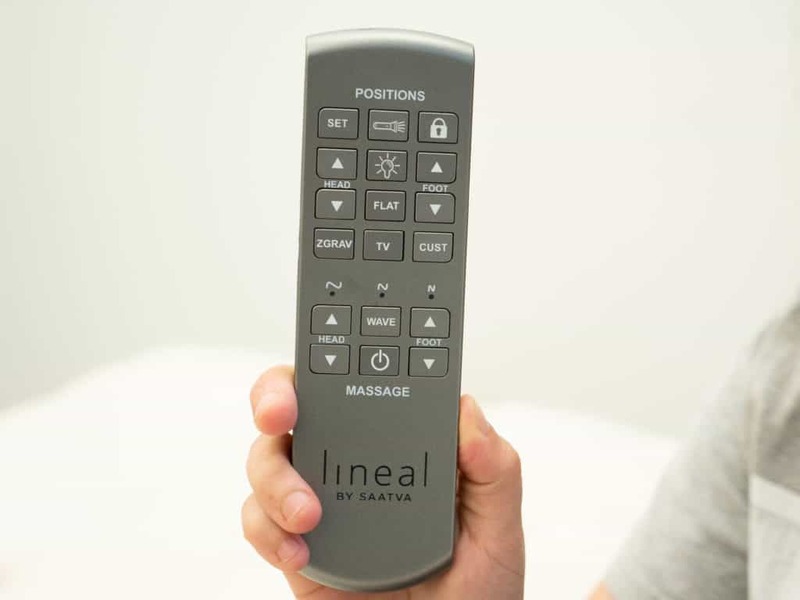 On the remote control, you’ll notice that under the control area marked “positions” is an area marked “massage.” The area marked “massage” is where you can control how and where your base massages you. There are three speeds varying in pressure, and you can set it to massage your head, your feet, or your full body using the button marked “wave.” The massage comes in the form of vibration rather, and there are no moving parts within the base that actually press into your body. SHOULD I TRY THE LINEAL ADJUSTABLE BASE? Likes to watch TV — If you like to sit up in bed and read, or watch something before dozing off, the preset TV position could be great for that. It sort of offers the perks of sitting in a reclining chair without having to leave the comfort of your bed! Isn’t great with a wrench — Something I love about this base is that you don’t have to set it up yourself! Saatva’s two-person delivery team will unbox and assemble your adjustable base in the room of your choice. Wants to save space — Thanks to the base’s wall hugging design, you can position your bed right up against the wall and not have to worry about damaging anything. This way, you can save space in your room while still enjoying the full features the Lineal has to offer. Adjustable height — Pin push legs are adjustable from 6″ to 10″, raising the Lineal from 14″ to 18″ off the floor. Remote Control — batteries included! You can buy your Lineal adjustable base from Saatva, Loom & Leaf or Zenhaven. 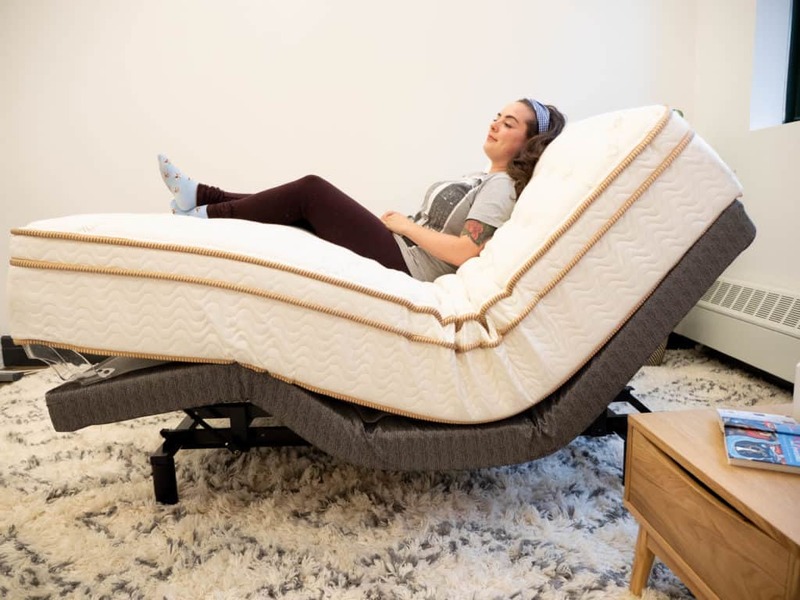 The Lineal is a luxury adjustable bed made by Saatva. 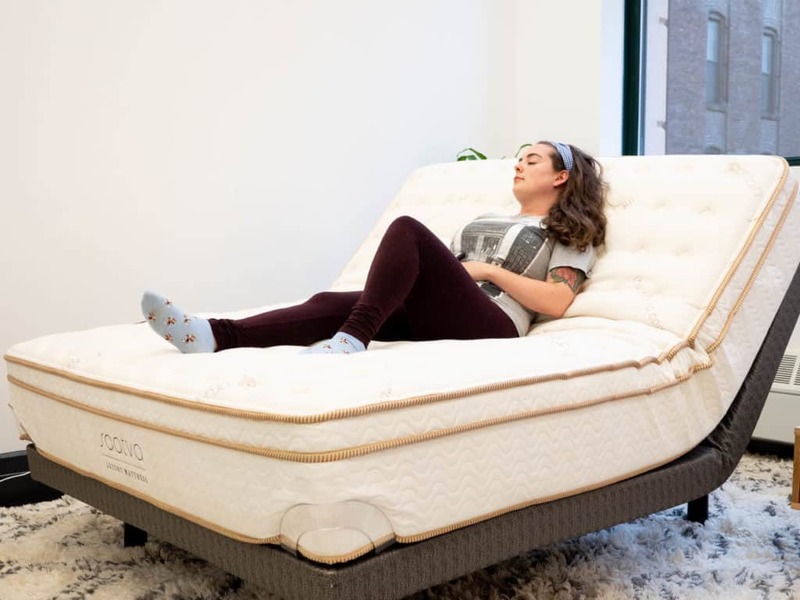 A wide variety of features and a well constructed frame come together to create a well-rounded adjustable base good for almost any adjustable mattress. Custom settings allow sleepers to program their favorite positions, in addition to the already pre-set positions available on the wireless remote. 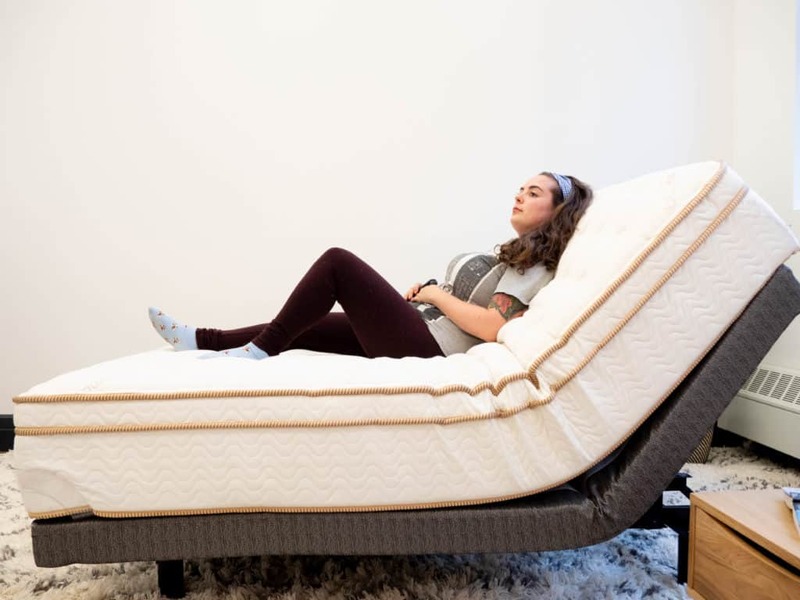 For the sleeper looking to add adjustability to their mattress, the Lineal is a great option to consider.